Imagine a Hebrew School where children don’t want to miss a day! They come in with a smile and leave humming to the tune of a Hebrew song. Imagine children who feel the warmth and spirit of Judaism and a strong sense of pride! At Chabad Hebrew School, families of all backgrounds feel welcomed and comfortable. Our school provides a creative Jewish education for children ages five through thirteen. We are proud of our achievements in the field of Jewish supplementary education. Our program is the best Jewish experience your child can receive in an after-school setting. We would love for you to come in and see our school in action! 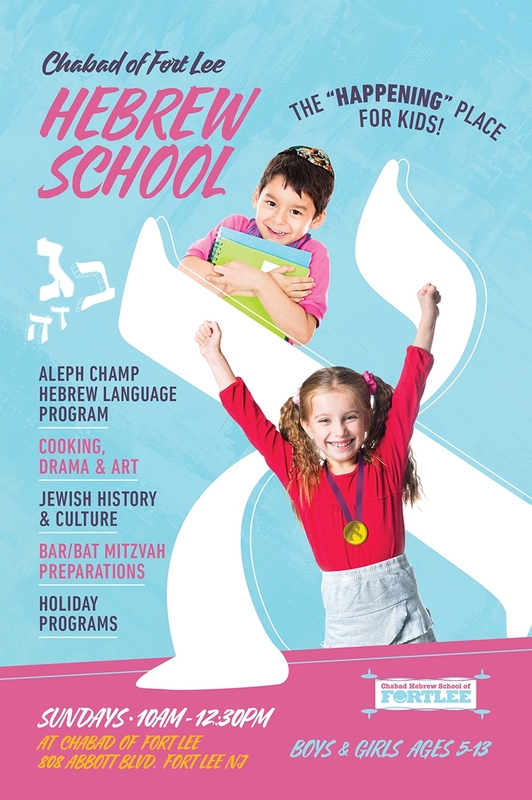 The mission of Chabad Hebrew School of Fort Lee is to provide and promote the highest quality out of Hebrew and Judaic education to a diverse community of Jewish children. Our aim is to nurture and build the foundation of your child's Jewish identity through our interdisciplinary educational approach. The focus of our dedicated teachers is to inspire a two fold love; a love for learning and a love for Judaism, while fostering a feeling of familiarity within their heritage for each individual child. A well-balanced Hebrew School education will develop in our students a commitment to using Jewish values as a guide to the decisions of life, community, and life-long learning and teaching. Discover and explore the Torah (Bible), the incredible history of the Jewish, people and see its relevance in today's day & age. Master Hebrew skills of reading and writing (click here to know about our reading program). Allow for students to express their opinions and questions about G‑d, Torah and religion. Our school’s underlying approach is for the children to enjoy the time spent so that they are left with positive feelings and fond memories of their Jewish education. Our program is thus carefully blended with songs, games, incentives, arts and crafts, drama, family celebrations and other exciting co-curricular activities. As each holiday of the Jewish calendar approaches, we will spend a great deal of time learning about the history, customs and traditions of the holiday. This will help bring meaning to the many beautiful, yet often strange rituals of our heritage. Expect your children to learn in depth about the following holidays; Rosh Hashanah, Yom Kippur, Sukkot, Chanukah, Purim, Pesach, Lag B’omer, and Shavuot. We encourage you to ask your children to share with you the many things they are learning about each holiday. This will help reinforce what they are learning in the classroom and may well add meaning to your family holiday celebrations.